As the world observes the 11th anniversary of the 9/11 terrorist strikes in the US Homeland, one hears less and less the pre-2001 calls of Al Qaeda for a global jihad against the Crusaders and the Jewish people and for the re-establishment of an Islamic Caliphate and one hears more and more calls for local jihads against local rulers and local enemies of Islam. This is so whether it be in Pakistan or Yemen or Somalia, or Iraq or Algeria or Mali or Nigeria. Al Qaeda talks no more of the International Islamic Front formed by Osama bin Laden in 1998. 2.The call now is no longer for an international Caliphate. It is now for myriad Islamic States ruled according to the Sharia and for waging a jihad against what they look upon as the pollution of Islam by enemies of Islam masquerading as Muslims.Whereas in the past, the Christians and the Jewish people were projected as the principal non-Muslim enemies of Islam, the Shias are now projected as an equally despicable enemy to be ruthlessly eliminated. 3.One increasingly finds this growing anti-Shia dimension of the Sunni/Wahabi terrorist ideology in Pakistan.The Lashkar-e-Jhangvi (LEJ), an affiliate of Al Qaeda and the Taliban, which has been spearheading the jihad against the Shias in Balochistan, Karachi, Gilgit-Baltistan, Punjab and the Kurram Agency, has declared them "wajib-ul-qatl" meaning deserving of death. 4. Pakistan has had a long history of anti-Shia violence from its birth in 1947. In Afghanistan too, when the Taliban was in power before October 2001, there were brutal attacks on Hazara Shias. But this anti-Shia violence has now acquired an ideological approval and a religious sanction. 5. The worrisome development is that Pakistan's elite and other so-called liberal sections, which occasionally even condemn the atrocities against the Balochs and the Ahmadias, have been silent on the atrocities against the Shias.Newspapers like the "Daily Times" of Lahore do draw attention to the anti-Shia acts of terrorism, but large sections of the media are maintaining a silence. 6.Over 300 Shias are reported to have been massacred since the beginning of this year, many of them dragged out of buses, lined up and shot dead.The so-called elite of Pakistan, barring some individual exceptions, has hardly protested. 7. The systematic and ruthless elimination of the Shias by the pro-Al Qaeda LEJ and the inaction of the State against the perpetrators are accepted as unavoidable by the elite and other liberal elements. The human rights of the Shias do not get the same support as the human rights of other minority groups. 8.Even the judiciary's tolerant attitude to the perpetrators of anti-Shia atrocities in the name of pure Islam has escaped strong condemnation.On September 11, 2012, a Lahore court granted bail to Lashkar-e-Jhangvi's chief Malik Ishaq, who had been recently arrested by the police for instigating attacks on the Shias.The leniency of the court reminded one of a similar lenient attitude by the judiciary towards Hafiz Mohammad Sayeed of the Lashkar-e-Toiba (LET) last year, when he was ordered to be released from police custody despite the evidence of his role in the organisation of the 26/11 terrorist strikes in Mumbai. 9. 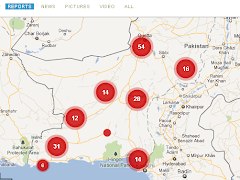 The increasing violence by pro-Al Qaeda elements in Pakistan has taken two forms----against the security forces by the Tehrik-e-Taliban Pakistan (TTP) and against the Shias by the LEJ.These are Pakistani organisations dominated largely by Punjabi Sunnis and Sunni Pashtuns. 10. There has, however, been a decrease in violence against Pakistani targets and interests by the Arab-dominated Al Qaeda operating from North Waziristan and headed by Ayman al-Zawahiri, an Egyptian. After the death of Osama bin Laden (OBL) in the US raid on Abbottabad on May1/2 last year, the Arab Al Qaeda suffered one more major set-back on June 4,2012, when its No.2 and ideologueAbu Yahya al-Libi was killed in a US Drone strike in North Waziristan. His death was confirmed by Zawahiri in a special video message released on September 11, 2012, coinciding with the 11th anniversary of the 9/11 attacks in the US Homeland.al-Libi was a cleric and a good religious motivator and his absence is being felt by Al Qaeda based in North Waziristan. 11. The repeated successes of the Drone Strikes are having an impact on Al Qaeda of North Waziristan, which has not been able to carry out any major strike in the West for nearly two years now. 12. Next to the Afghan and Pakistani Talibans, the LET and the LEJ, the most capable and lethal terrorist organisation today is the Al Qaeda of the Arabian Peninsula (AQAP).Its reach, motivation, reservoir of cadres for suicide terrorism and lethality were demonstrated on the 9/11 anniversary on September 11.A car bomb targeting Yemeni Defence Minister Major General Muhammad Nasir Ahmad exploded outside the Prime Minister's office in Sanaa , killing at least five bodyguards but the Minister reportedly escaped.The attack was reportedly in retaliation for the death of AQAP's No.2 Said al-Shehri, in an attack in eastern Yemen last week. 13. The AQAP, which is also called the Ansar al-Shria (Supporters of the Sharia), operates from Yemen.It used to be headed by Anwar al-Awlaki, a US citizen of Yemeni origin. After his death in a US Drone strike in September last year, it is reportedly led by Nasir al Wuhayshi, who was the chief of staff of OBL in Kandahar before 9/11. ( a ). It focusses its recruitment drive through the Net on English-knowing young Muslims of non-Arab extraction.Many young non-Arab Muslims, including Pakistanis and members of the Pakistani diaspora in the West, are now believed to be going to the training camps of the Ansar in Yemen and not to the training camps of the old jihadi organisations of Afghan vintage in the Af-Pak region. ( b ). It advises its supporters in different countries to adopt not the catastrophic or mass casualty terrorism favoured by OBL and his advisers, but a simplified form of jihad that could be easily or self-learnt, with the use of modus operandi such as assassinations of targeted individuals, driving a motor car over the target etc. ( C ).It produces its propaganda and motivational literature in English and disseminates them through the Net. 15. The available details of the interrogation of the 18 Muslims arrested in Bengaluru, Hubli, Hyderabad and Maharashtra indicates more the influence of AQAP and the Ansar on their motivation and operational thinking than that of jihadi organisations of Afghan vintage. 16. The Al Qaeda of Afghan vintage was never able to win much influence over young Indian Muslims. The motivation of these 18 Muslims through the Net would indicate that the AQAP/Ansar may be having a greater impact on the minds of the educated and English-proficient young members of our Muslim community.